Beauty and the Beasts — in the Garden? Well, without a doubt, this is the beauty. 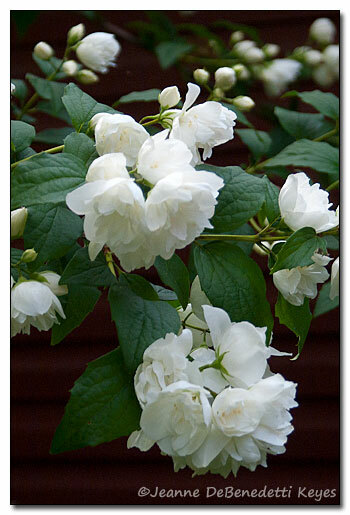 A pure white, frilly, double-petaled mock orange, Philadelphus x virginalis, accompanied by rich, dark, green, leaves. 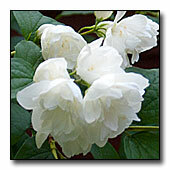 The fragrance coming from these luscious flowers is unbelievable. I cannot get enough of this intoxicating scent! But alas, she is surrounded by horrible weeds that seek to cover up her beauty and distract the lowly gardener from her lovely visage. Ah, but beauty is in the eye of the beholder, yes? 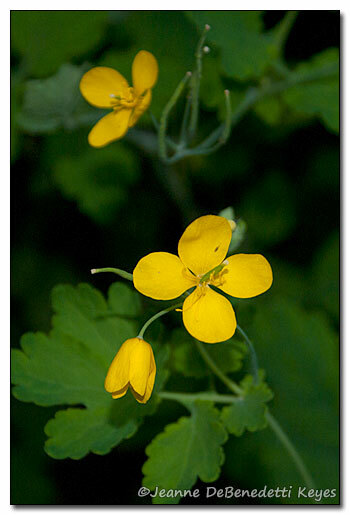 To many, the little, yellow buttercup flower (below left) is quite sweet. But a gardener will recognize the evil for what it is—Ranunculus acris. One small, little weed two months ago has now become four, huge monster plants that seek to dominate and wantonly spread seed all over the garden. 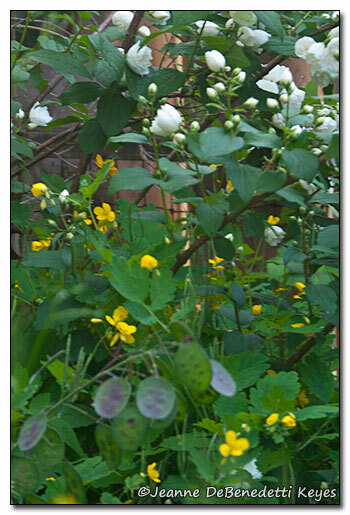 As you can see in the photo below right, the buttercup is tall enough to cover the lower branches of the mock orange. Here, you can also see money plant, Lunaria annua, just before the seed pods have ripened into their characteristic silvery, paper-like form, often used in flower arrangements. Money plant can also be a nuisance if you don’t remove the plants before they set seed. 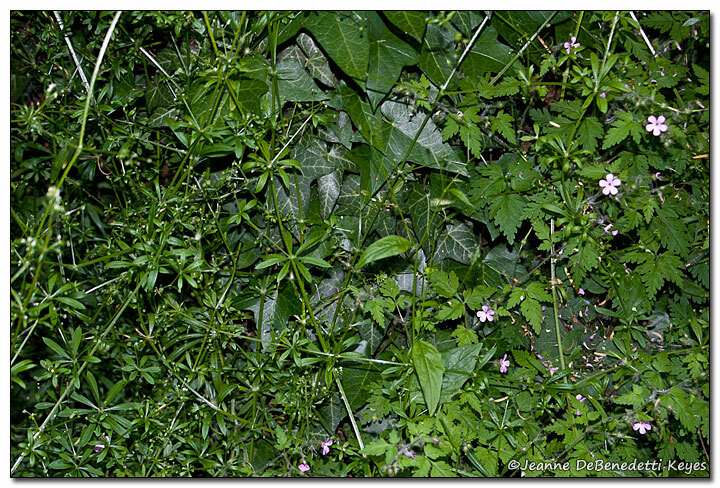 Lastly, what about this unholy trio, English ivy (Hedera helix bottom photo), herb robert (Geranium robertianum) and catchweed bedstraw (Galium aparine)? 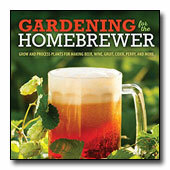 I discuss these weeds in this two part article. They also seek to smother every plant in their path. Luckily, the siren scent of the fair damsel, Philadelphus x virginalis, calls me from many parts of the garden to rescue her from the dark, smothering embrace of English ivy and catchweed bedstraw! May she live happily ever after.